Mind control has gone from science fiction to science fact thanks to a remote-controlled brain implant that can control the path taken by mice, as footage released Tuesday by neuroscientists shows. The implant, which is narrower than a human hair, alters the neural networks of the mice using wireless signals, allowing researchers to study neural stimulation without invasive procedures. The “optofluidic” implant was developed by a team from the Washington University School of Medicine and the University of Illinois with the hope that it could one day be used to treat a range of neurological disorders in humans by targeting therapies to the patients’ specific neural networks. Neuroscientists were previously limited to injecting drugs in ham-fisted ways with larger tubes, and delivering photostimulation through fiber-optic cables, which require surgery and restrict the movement of the animal being tested. The battery-powered device is implanted in the head of the mouse and is fitted with reservoirs of drugs that are used to alter brain functions. 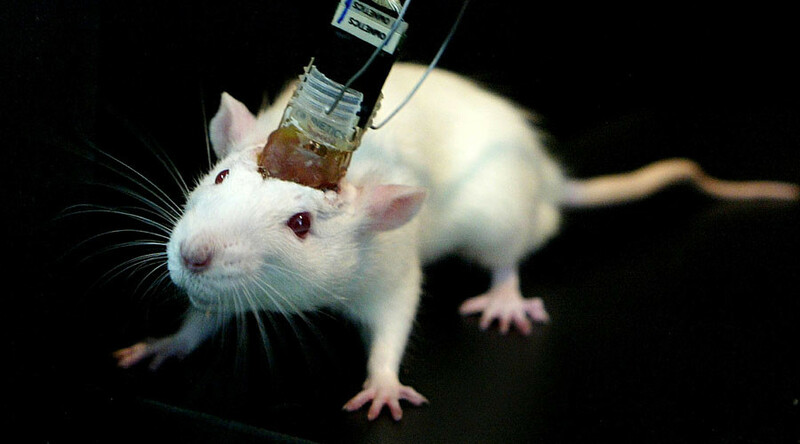 In one experiment, the implant was used to make mice walk around in circles by injecting morphine into the part of the brain that controls motivation and addiction, according to the Sydney Morning Herald. The research, published in the scientific journal Cell, could lead to the development of minimally invasive techniques to treat neurological afflictions including depression, addiction, and chronic pain disorders.